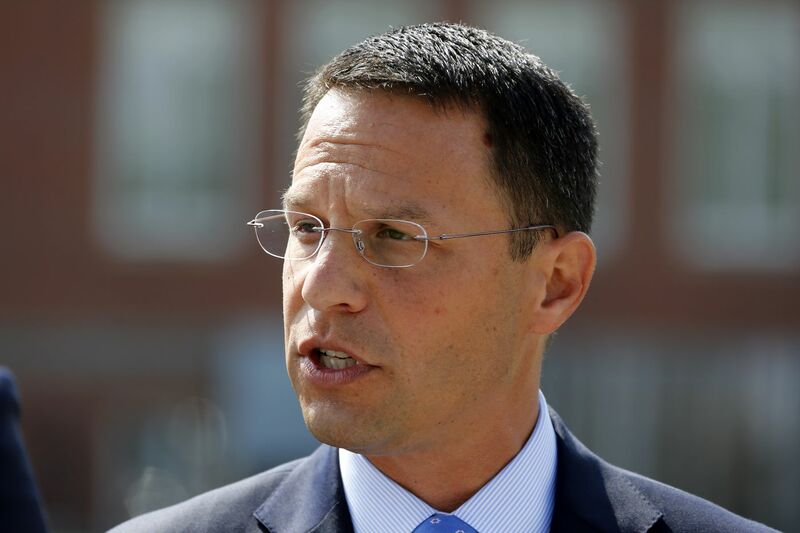 The office of Pennsylvania Attorney General Josh Shapiro, pictured above, oversaw the investigation into clergy sexual abuse. HARRISBURG — Though a judge has cleared the way for the release of a key court document involving the grand jury report on Catholic clergy's sexual abuse in Pennsylvania, the state's highest court on Friday closed for the day without making it public and without explaining why. The court document was written by the state Attorney General's Office, which led a nearly two-year grand jury investigation into allegations of abuse by Catholic clergy in six of the eight dioceses in the state. It is expected to reveal new details of what is in the more than 800-page report the grand jury produced, portions of which lawyers for current and former clergy members are attempting to block from release on grounds that the report is inaccurate or unfair. Late last week, the state Supreme Court released filings by lawyers for those clergy, who are named in the grand jury report but whose identities have not been publicly revealed. But on Friday, the court delayed posting the attorney general's response to their claims, despite a court order earlier in the day by Cambria County President Judge Norman A. Krumenacker III paving the way for its dissemination. Krumenacker was the judge who oversaw the grand jury's work. Stacey Witalec, spokesperson for the Supreme Court, declined to explain why the court had not made the filing public. The Attorney General's Office also declined comment. The battle over the report's release has become fraught. Dozens of victims of clergy abuse who testified before the grand jury about their experiences have anxiously awaited its public dissemination, and fear that their voices will be silenced again if lawyers for the clergy succeed in court. In a statement late Friday, State Rep. Mark Rozzi (D., Berks), a survivor of clergy abuse, called the legal jousting in the case "reprehensible." "The millions of dollars of congregants' money spent on lawyers and lobbyists, the secrecy, scare tactics, collusion, and disgraceful cover-up of pedophiles — all of it must stop," he said. The high court previously said the clergy members could challenge the attorney general's response if they believed it contained secret grand jury material. The seven-page order issued Friday by Krumenacker indicated that some had done that, objecting to the inclusion of passages they contend contain "the specific factual findings" by the grand jury. Krumenacker disagreed, saying the attorney general's response "may be filed as a public record at the discretion of the Pennsylvania Supreme Court." He also said the clergy raised additional issues that were outside of his jurisdiction. The grand jury report is the culmination of an investigation by Attorney General Josh Shapiro's office into allegations of clergy sexual abuse stemming back decades. In addition to the six dioceses, those of Philadelphia and Altoona-Johnstown went under similar scrutiny in the past and were not included in the grand jury's inquiry. Shapiro had been expected to make the report public last month. The number of people named in the report has not been released. About two dozen of the former and current clergy members named in the report appealed to the state's highest court, claiming that the grand jury's report violated their right under the state constitution to their reputation. They have also taken aim at the grand jury, an investigatory body that meets in secret and that has been used in the state for decades. The petitioners contend they were stripped of due process while the grand jury was hearing evidence, leaving them unable to counter evidence prosecutors were presenting. Under state law, investigating grand juries can recommend charges or produce a report. The law gives the judge supervising the grand jury the discretion to allow individuals who are referenced in the report, but not charged with a crime, to submit a written response prior to the report's public dissemination. That happened with this report, as the six dioceses under scrutiny — Pittsburgh, Erie, Allentown, Harrisburg, Scranton, and Greensburg — were allowed to review it. Individuals named in it also received parts of the report that referred to them. Late last month, the seven-member Supreme Court placed a temporary stay on the report's release so it could sort through the arguments from both sides. Much of the court fight has played out in secret. Only recently did the justices order that documents related to the case be made public, although in redacted form. Nine media organizations, including the Inquirer and Daily News and the Pittsburgh Post-Gazette, have petitioned the court for access to the full report.